We were thinking to ourselves that it might be a Western Sandpiper, and were surprised at the variety of responses. One birder thought was a Western Sandpiper. Others thought it was a Dunlin. 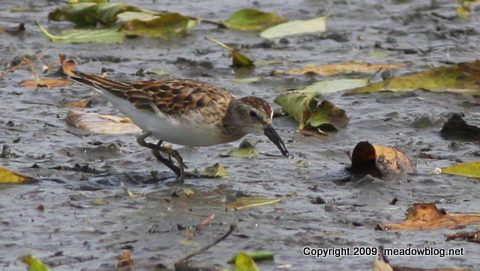 Another thought it was a juvenile White-rumped Sandpiper. We decided to ask Kevin Karlson, author of "The Shorebird Guide," for his diagnosis: "None of the above." Click "Continue reading…" for Kevin's verdict, and the thinking that went into it.